Remainers within Theresa May’s government may have persuaded her to accept continued submission to the European Court of Justice as the price of a deal with the EU, as negotiators demand Britain stay within the courts for years after the official Brexit date. But the Government is now considering a so-called transition deal which would see the Luxembourg-based court continue to hold sway over Britain for a “limited time”, according to reports. “The transition rules could involve the ECJ for a limited time. That’s a matter for negotiation,” said a spokesman for the Prime Minister on Monday. The news comes amid reports that EU lead negotiator Michael Barnier is to demand that Britain remains subject to the European Court of Justice after Brexit. The Daily Telegraph reports this means that despite Britain leaving the European Union, it would still have to accept rulings from the court for over a decade after the official separation. EU negotiators have adopted a rigid, belligerent stance on ECJ jurisdiction, insisting that any “time-limited prolongation” of EU rules would “would require existing Union regulatory, budgetary, supervisory, judiciary and enforcement instruments and structures to apply [to Britain]”. Brussels has even suggested that the ECJ or an ECJ-like body, rather than the British courts, should continue to be the final court of appeal for EU nationals living in the United Kingdom. Lead negotiator Michel Barnier has said the ECJ should be able to demand “a lump sum or a penalty payment” from Britain if it should break a yet-to-be-confirmed deal on EU nationals’ rights after Brexit. The proposal has been condemned even by former members of the court, such as Belgian jurist Franklin Dehousse, who said such a situation would be “for the UK worse than the status quo,” and tantamount to “judicial imperialism”. Rees-Mogg described the proposal that the EU’s courts should have jurisdiction over EU nationals in Britain as “preposterous”, branding it “a very condescending, high-handed, colonialist approach. 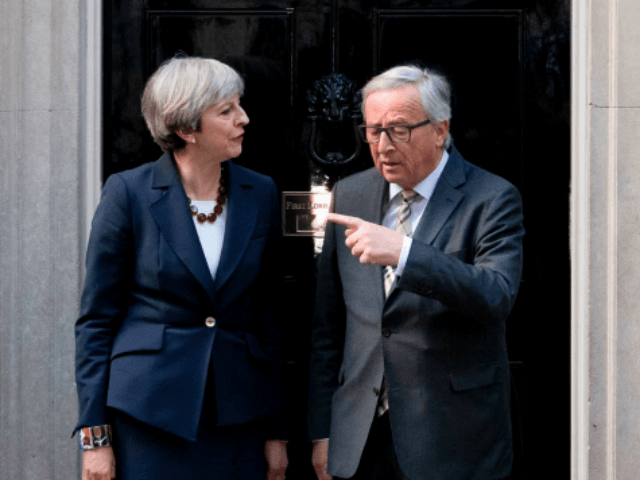 It is not clear why Brussels loyalists in Britain feel it is so vital to appease the bloc, as research indicates that the price of ‘No Deal’ would be relatively low. Such a situation would see Britain trading with the EU on World Trade Organization (WTO) terms, as it currently does with the U.S., Japan, and other major economies with which the EU has failed to secure a deal. This would mean tariffs of around £5.2 billion for British exporters but, crucially, tariffs of around £12.9 billion for EU exporters, leaving the UK significantly ahead and able to compensate firms through a combination of investments, subsidies, and general tax cuts which could well increase their overall competitiveness, without breaking WTO rules. The Government would also be free to sign a raft of trade agreements with countries outside the EU, with both the United States and Australia declaring their enthusiasm for quick deals with Brexit Britain. EU leaders in countries such as Hungary have already recognised the threat which this poses, and warned Brussels to adopt a less hostile attitude or else face a “nightmare scenario” in which European exporters’ competitiveness would be badly damaged in their most important export market – which is what the United Kingdom will be after Brexit.